Abigail Curtis, a postdoctoral fellow at the American Museum of Natural History in New York, demonstrates how computed tomography reveals unexpected scientific insights into bat physiology. X-ray with computed tomography is used to create digital reconstructions of modern and fossilized bat samples. These images enable research into how bat species have developed specialized anatomy for eating, communicating, and locating food. Most importantly, researchers are using non-destructive testing methods to share digital scans of bats to collaborate on a global scale. When you think of natural history museums, you probably think of things like dinosaurs rearing up improbably, or dioramas with cave men, or living forests and bio-domes. Or, maybe you think that it's a good place to employ out-of-work actors. There are all kinds of things like this in natural history museums around the world. Education is a massively important role that museums play, but, actually, behind the scenes they're legitimate research institutions, and they play an important role in academic research for a whole range of different fields. Computed tomography (CT) goes light years beyond regular 2-D X-ray technology to deliver accurate three-dimensional images of scanned objects, including their voids and areas of differing density. Jason Robbins, YXLON Senior Product Manager, explains the science of CT in this (fun and nerdy!) educational video. You are invited to attend a free CompositesWorld.com webinar to learn how computed tomography (CT) can be used for the inspection of fiber orientation. The reality is this: The items you examine in your X-ray system need to be carefully supported, controlled and angled so the scanning process happens accurately, and each scan is 100% reliable. Poor-quality manipulators may require several different images be taken and edited due to alignment issues. This inevitably results in time consuming, costly problems. That's why we encourage all potential buyers for industrial computed tomography (CT) X-ray equipment to be aware of the key features to consider when choosing manipulators. Here are our top three. 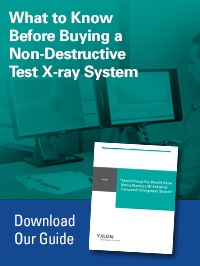 Too much of the wrong data from your non-destructive test (NDT) system can be overwhelming, and incomplete data can sabotage your test strategy and negatively impact production. Some Computed Tomography (CT) machines can examine samples using different imaging techniques, so how you can select the right CT system features to generate better image results for your specific application? Here, we examine different imaging features that work best for different application tasks.